Shopify Amazon Integration – Why, How and the Best Practices! Before starting on the Shopify Amazon Integration, let’s recap some of the basics about the Shopify and Amazon platforms. Shopify is a great hosted platform to start your eCommerce site. It has provided a free trial in order to let you to check if it meets your needs. So, if you haven’t checked how this platform facilitates your eCommerce store needs, you can start your Shopify trial from here. Similarly there are numerous benefits offered by Amazon marketplace. In order to grab the benefits of both these platforms, Shopify Amazon Integration is the only way. 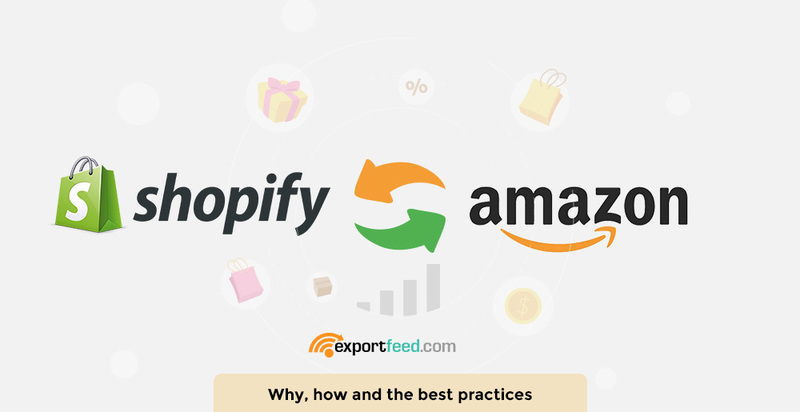 Why ExportFeed for Shopify Amazon integration? Why is Shopify one of the most preferred platform? Shopify also facilitates features addition to websites through the Shopify App Store where many developers have listed their free and premium apps. You can get apps even for Shopify Amazon Integration. There are wide variety of marketing apps on Shopify App Store. To add some specific functionality on your site, you can easily visit Shopify App Store from your Shopify Dashboard and search for that feature. Among the Amazon marketplace integration apps, we have also listed our Shopify Amazon App.